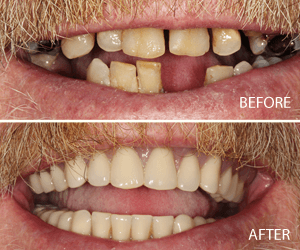 Here you’ll find just a few of the many smile transformations completed by Chemong Family Dental. 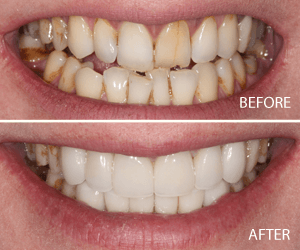 To see the “before” photos simply click the arrows and slide the bar back and forth across the photo. 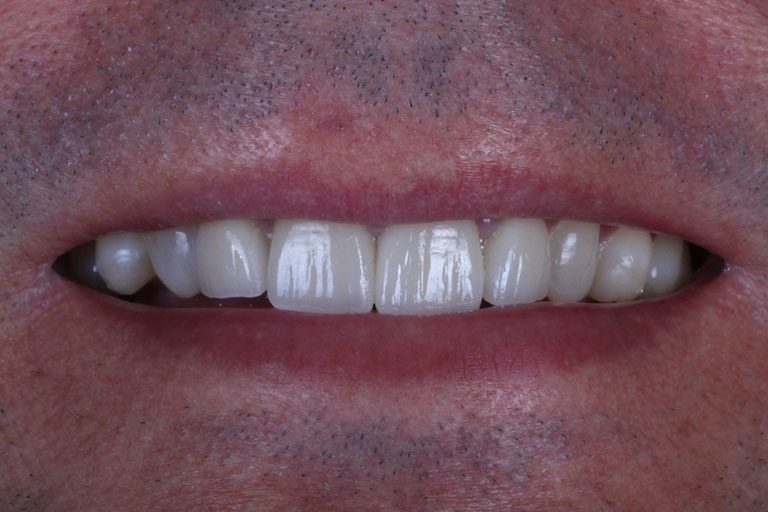 *Note: These are all actual cases that were done by Chemong Family Dental, the names have been changed to protect the privacy of our patients. 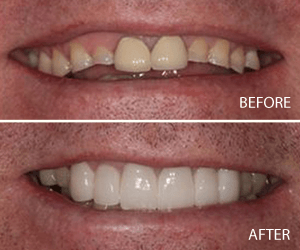 Mike* came to us looking to get a picture perfect smile for his wedding day. 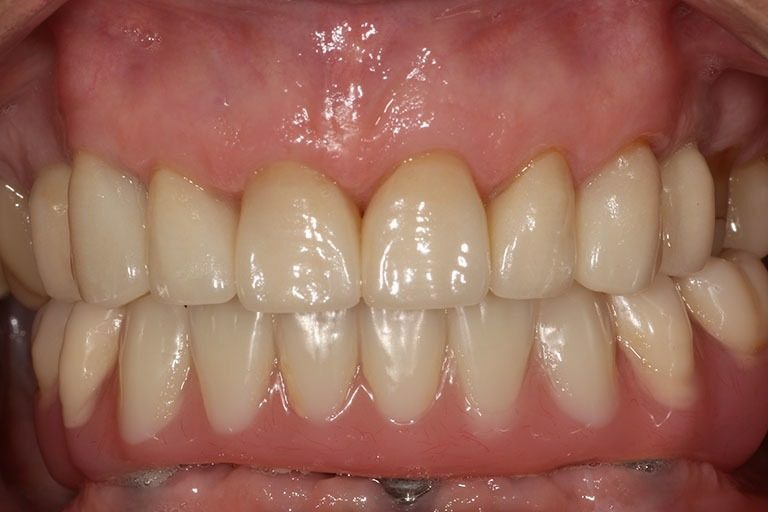 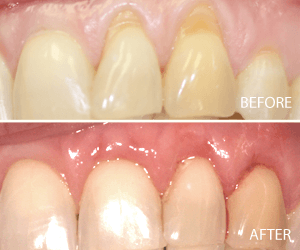 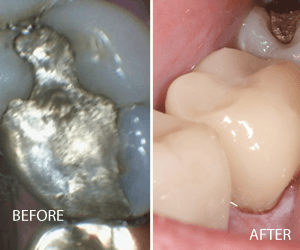 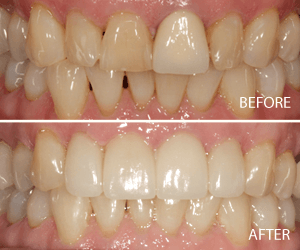 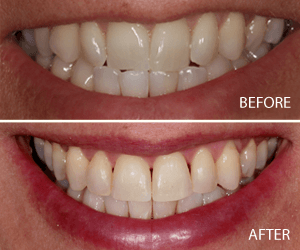 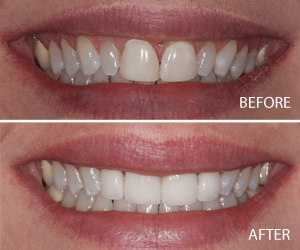 We did a combination of 4 veneers, orthodontics and 1 implant to address the position, shape, and colour of his teeth as well as bite problems. 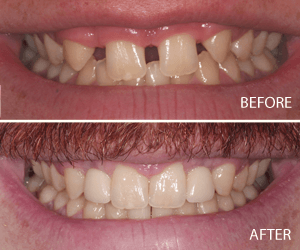 These small changes made a huge difference and had him smiling with confidence in time for his big day! 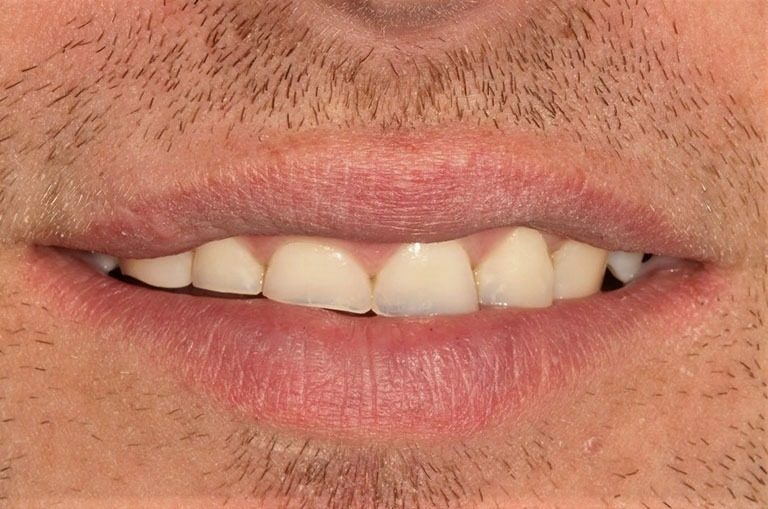 Derek* came to us self-conscious of his smile. 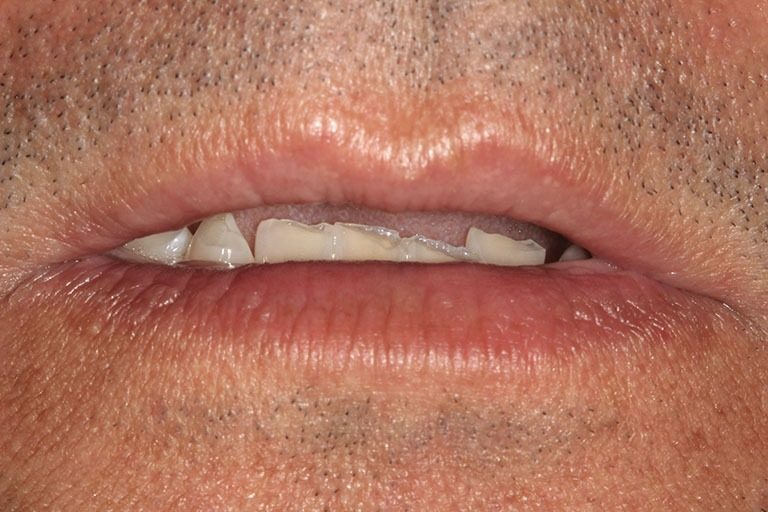 Since he had an unconscious habit of teeth grinding his teeth were visibly shorter, plus he was unhappy with shape and position. 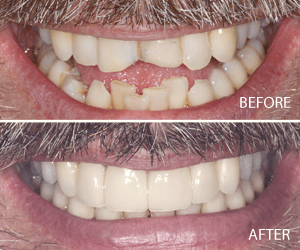 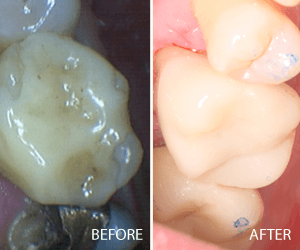 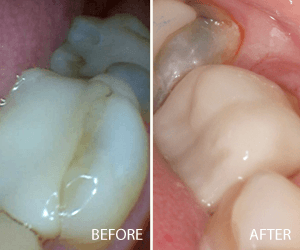 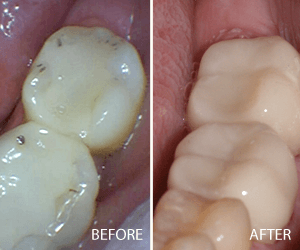 Through a combination of 6 porcelain veneers & composite build-ups, as well as a KOIS appliance to fix his bite we were able to correct these challenges and transform his smile. 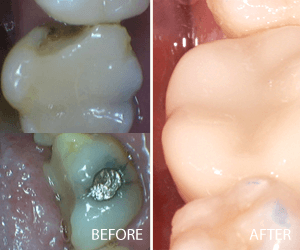 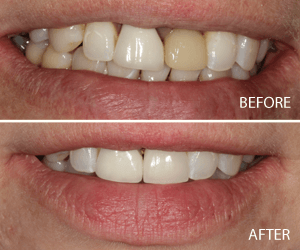 Ashley* noticed her front tooth was becoming more and more discoloured due to previous dental work and was causing her to feel self-conscious when she smiled. 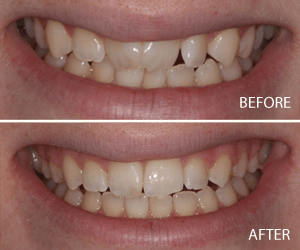 We determined 4 veneers were all she needed to smile with confidence again. 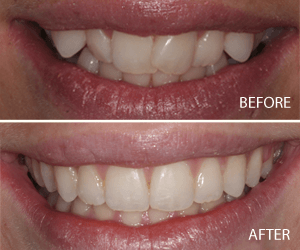 Every time Ashley visits our office now she gushes about how much she loves her smile makeover and all the compliments she receives on it! 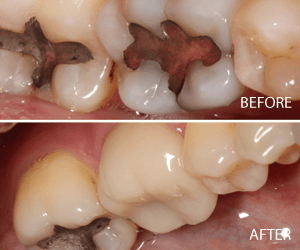 A great example of how small changes can make a big difference. 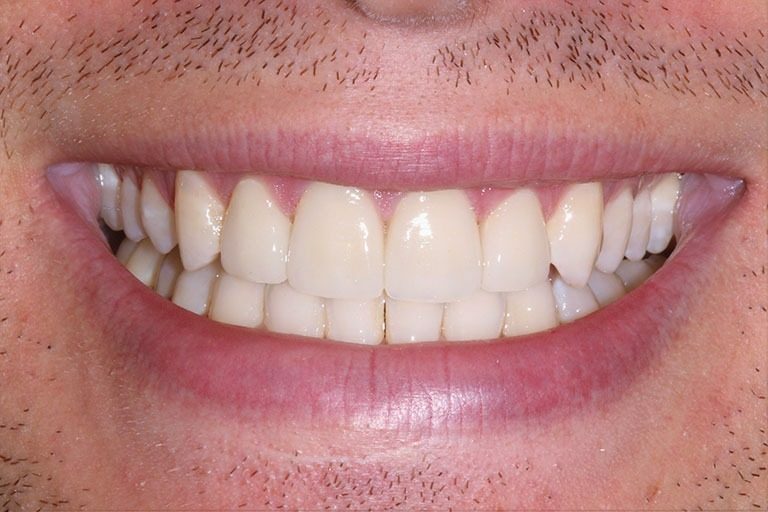 John* didn’t like how he couldn’t really see his teeth when he smiled and the teeth that he did see were crooked or misshapen. 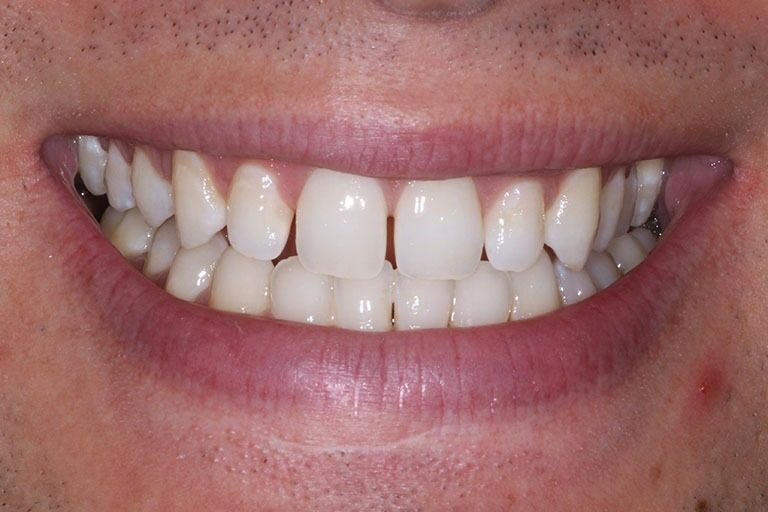 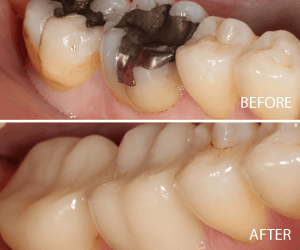 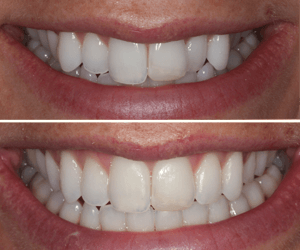 With a combination of 4 veneers, composite build-ups, composite bonding & a KOIS appliance we were able improve the colour, shape and position of his worn down teeth as well as correct his bite. 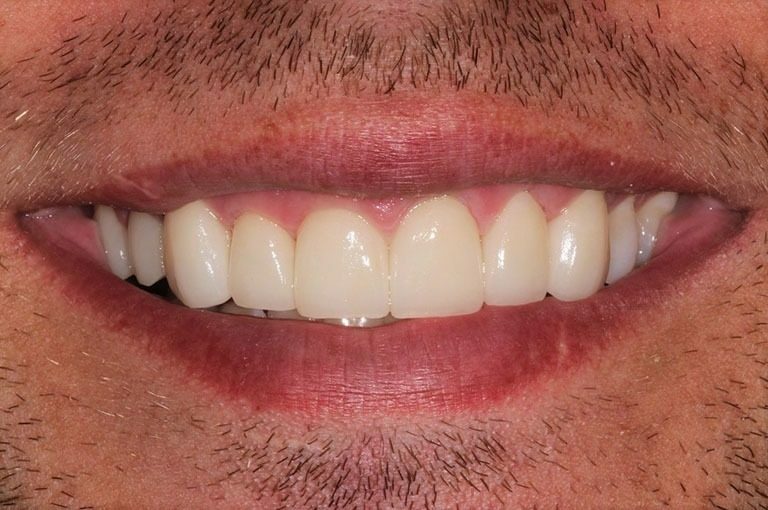 He was thrilled with the natural looking result! 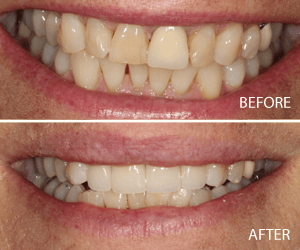 Anne* has wanted to improve her smile for many years. 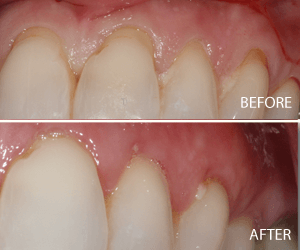 She came to us with bite problems that were causing her constant pain. 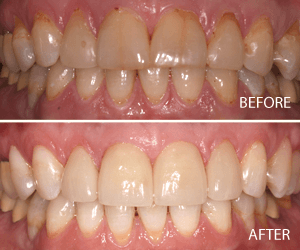 We addressed this with a KOIS deprogrammer and determined she had a constricted chewing pattern. 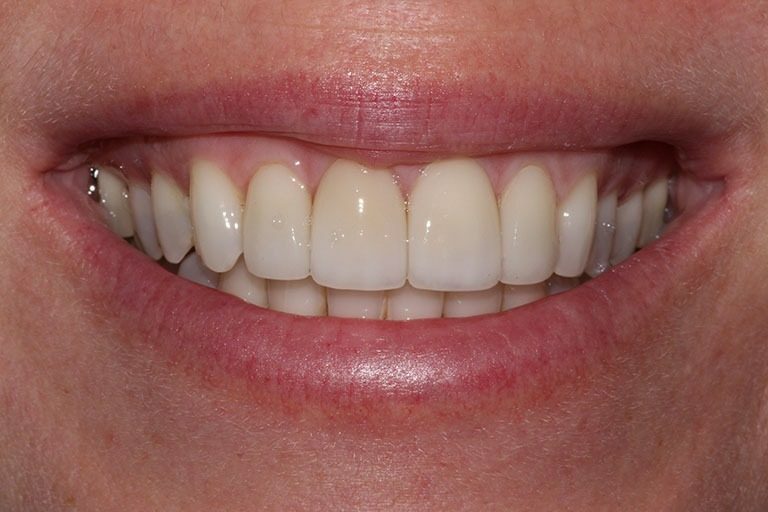 She ended up getting braces on her upper teeth for 3 months to correct her bite and then we did a full-mouth restoration with 20 veneers. 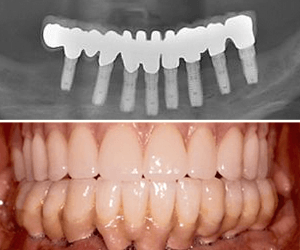 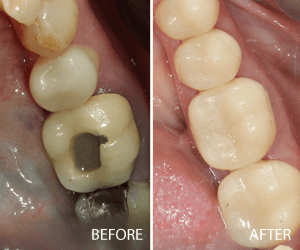 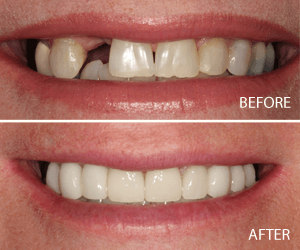 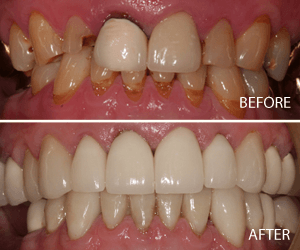 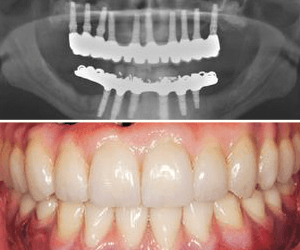 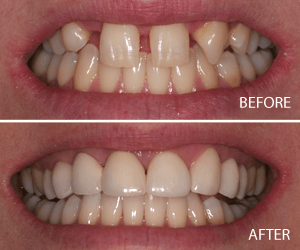 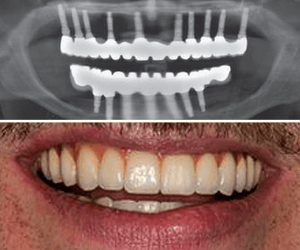 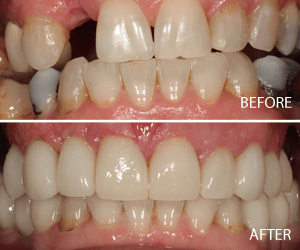 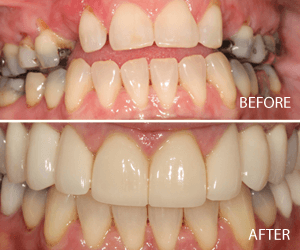 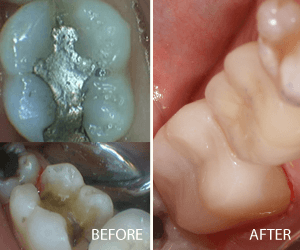 This case is one of my favourites as it was easy to see this was truly a life-changing smile makeover! 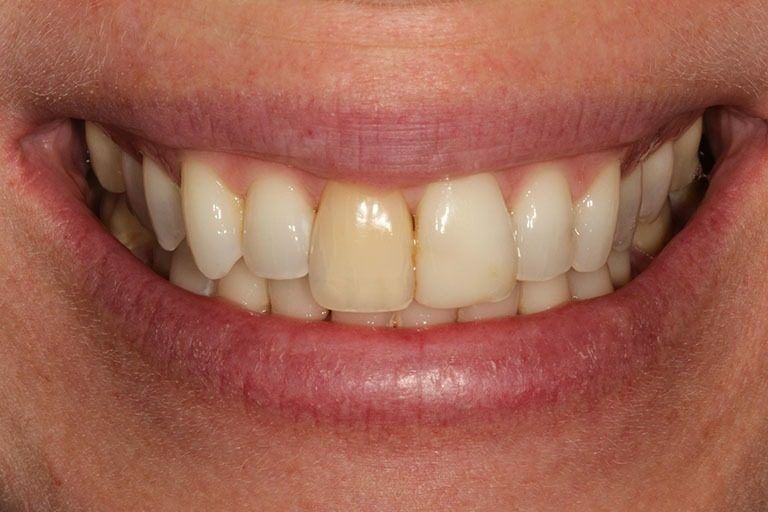 Sarah* was self-conscious of her smile. 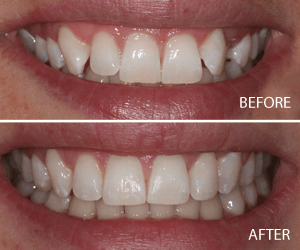 She told us “I don’t like how I can’t see my teeth when I smile and they’re getting so short I have trouble eating”. 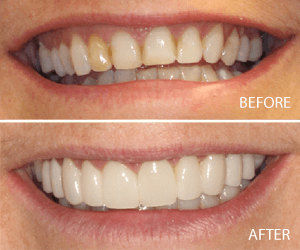 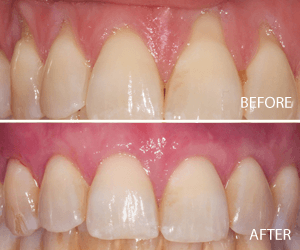 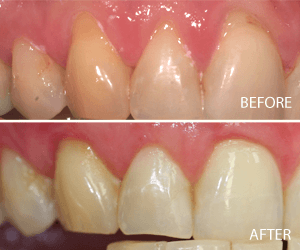 She was experiencing joint problems and wasn’t happy with the colour and shape of her small worn-down teeth. 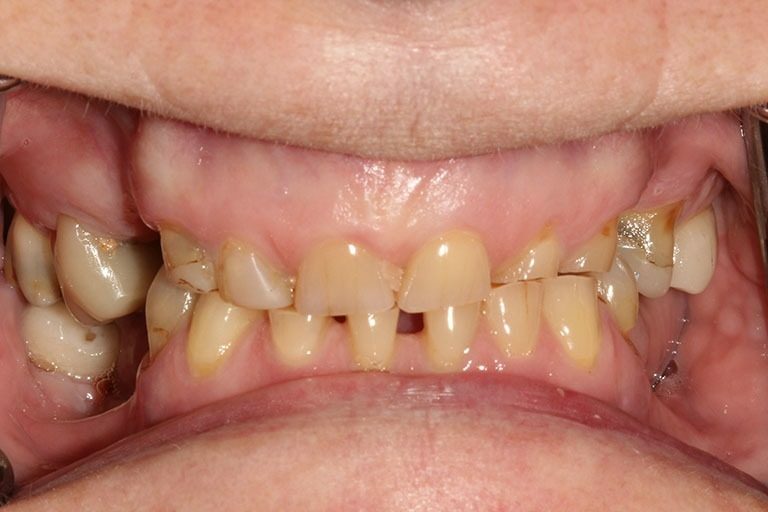 Plus she had some missing teeth that were causing her teeth to move. 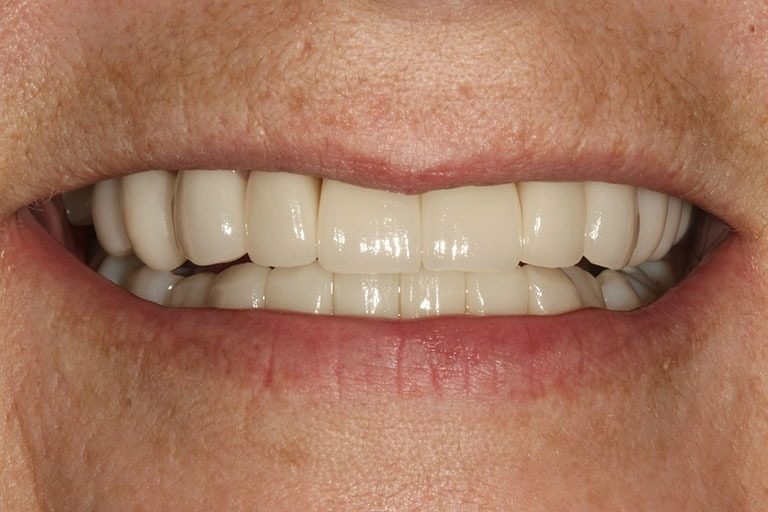 To help Sarah* smile with confidence again we transformed her smile with a full-mouth restoration, which entailed an implant secured lower denture & on her upper we did a combination of implants, crowns and veneers. 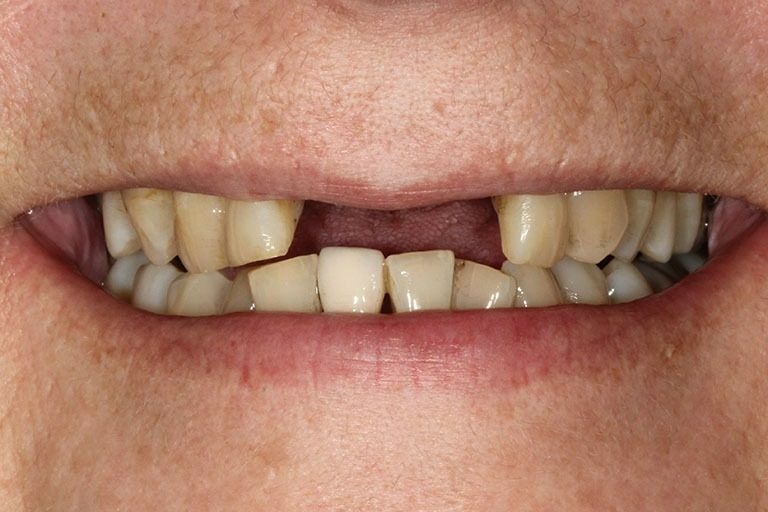 Mary* was embarrassed of her smile and wanted to fix the gap from her missing front teeth and the colour and shape of her teeth. 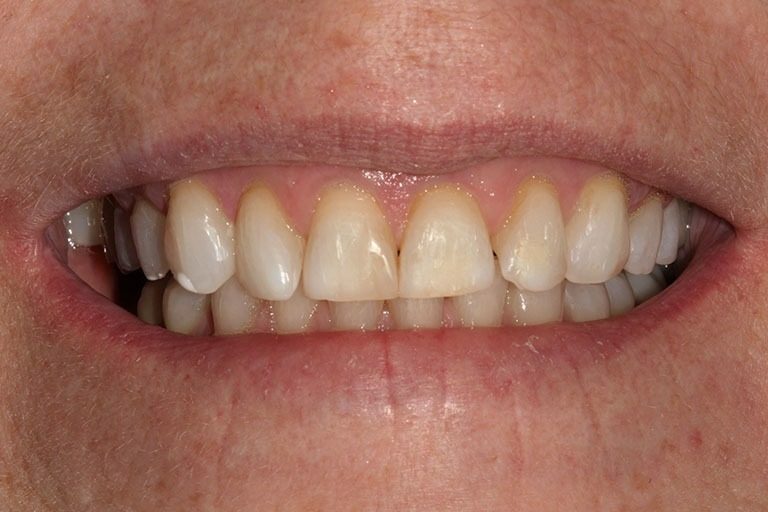 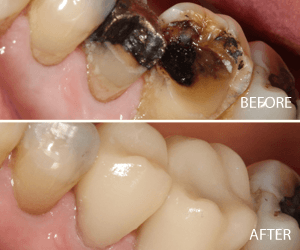 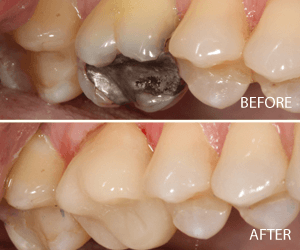 Since she has terminal gum disease, decay, missing teeth and significant wear, giving her a healthy foundation to build on was imperative. 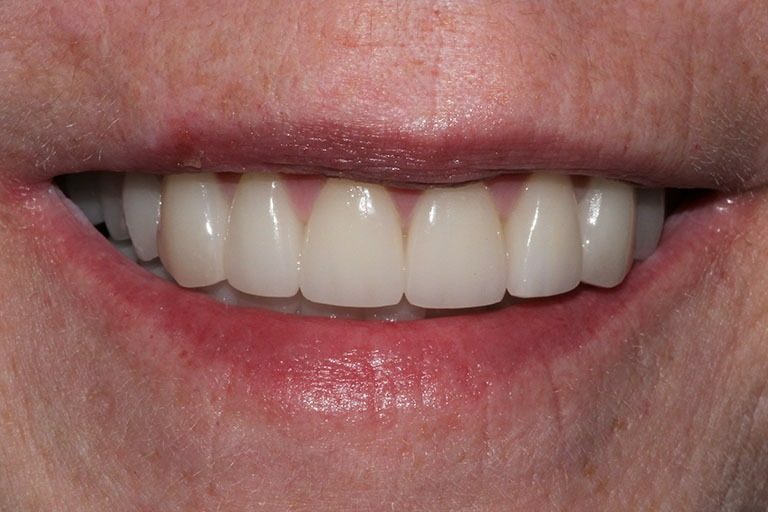 Then we addressed aesthetic issues by placing 2 dental implants to replace her missing front teeth, and a full mouth of porcelain veneers.